GLENDALE, Ariz. (AP) The Arizona Coyotes signed Darcy Kuemper to a two-year contract extension Thursday, a day after acquiring the goalie from the Los Angeles Kings. Financial terms were not disclosed. The Coyotes sent speedy forward Tobias Rieder and goalie Scott Wedgewood to Los Angeles in the trade. The 6-foot-5 Kuemper, from Saskatoon, Saskatchewan, was 10-1-3 with a 2.10 goals-against average and three shutouts in 19 games for the Kings this season. He will team in goal with starter Antti Raanta. 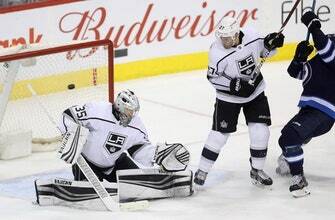 Kuemper is 51-35-17 with a 2.52 GAA and 10 shutouts in 104 career games with Minnesota and Los Angeles.